In every home, dust can be a constant issue as it can accumulate on surfaces and items, causing things to become dirty and appear faded. But with ServiceMaster Cleaning & Restoration Services’ professional house cleaning and maid service in Middlesex, NJ, we can help keep your home appearing its best. To learn how to clean and reduce dust within your property, see below. Clothing and closets are one of the primary sources of dust. The fibers of clothing, towels, and linens, can all trap dirt and dust, and is a vehicle used to spread dust into other areas. It only takes a small gust of wind, a slight abrasion, or gentle pat, to release the trapped dirt and dust, which can then travel to land on tabletops, décor items, windowsills, and more. Much like clothing, carpets are also a prime contributor to dust.Carpets cover one of the largest surfaces of any home, and when dust is in the air it will eventually settle onto a surface, most likely your carpeting. Also carpets trap plenty of dirt that track in from shoes, socks, clothing, and will spew back into the air anytime someone steps or drags something across your carpets. HEPA filters can collect and trap up to 33% more dust than vacuums with regular air filters. 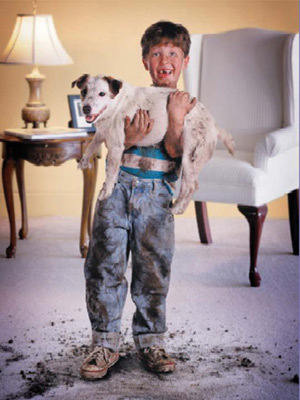 To clean your carpets while capturing the most dust and soil, invest in a quality vacuum cleaner with a HEPA filter. Avoid dry dusting and use a damp dusting approach. Use items such as a Swiffer wiper, dusting spray such as Pledge, or even a damp cloth. Damp dusting will help clump dust particles together, making it easier and more efficient to trap and collect dust. Using a dry cloth or feather duster to remove dust will do very little to collect dust and only pushes the dust around or back into the air. With cloth items being a main contributor to dust, on a routine basis use a lint roller on your clothes to collect loose pieces of fiber from your clothing. For furniture items such as cushions, blankets, and mats, take them outside and strike them with a broom to release all of the loose dust, fabric fibers, and dirt that have accumulated. With these tips, you may be able to reduce a substantial amount of dust within your home. When you find yourself strapped for time or would like professional assistance, rely on ServiceMaster Cleaning & Restoration Services to provide high quality maid service in Middlesex, NJ. We’re the experts you can rely on to keep your home clean, organized, and maintained. Contact us today for more information on our services for house cleaning in Middlesex, NJ and the surrounding areas.